It’s no longer just movies or television that launches the latest It Girl celebrity. It’s social media. A person who starts a blog, web page, Instagram, Twitter or myriad other social media platforms, if they hit the right note, the right moment, and persevere with quantity (and hopefully quality content) they can gather thousands if not millions of “followers”. From there, Publishers take note. Someone who already has a built-in audience is more attractive to them as a potential client than someone who is not. 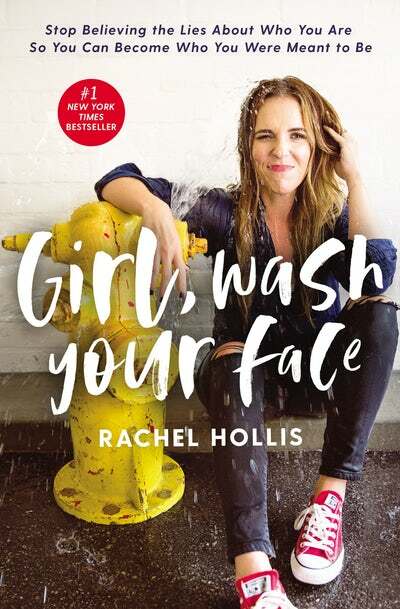 Rachel Hollis is a Los Angeles event planner turned entrepreneur turned podcaster turned TV guest commentator, social media darling, and author. Almost ten years ago she started her blog, The Chic Site. Her honest voice and her winsome (and savvy) ability to connect through writing and speaking about lifestyle, has launched Hollis to front place on bestseller lists, top entrepreneur lists, and most any other list you can list. Though Hollis has written several novels in the Romance genre, her latest book has hit the bestseller lists like a tsunami. It’s a How-To/Advice book called Girl, Wash Your Face. Seventeen weeks ago, it vaulted to the top of the Advice/How-To NY Times bestseller list and has stayed there. Published 6 months ago as of this writing, the self-help advice book has over 4,000 reviews, 96% of them 4 or 5-star. It’s currently #4 on Apple’s iBooks list. 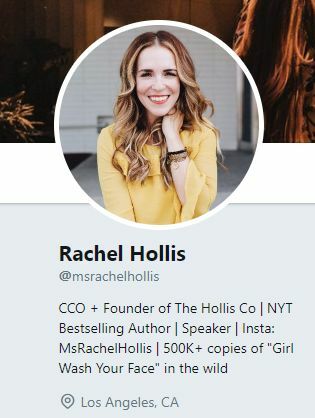 With wry wit and hard-earned wisdom, popular online personality and founder of TheChicSite.com Rachel Hollis helps readers break free from the lies keeping them from the joy-filled and exuberant life they are meant to have. So, according to Hollis, I’m supposed to be having a joy filled life of exuberance but the world has lied to me and I’m not living that life but Hollis is going to help me achieve it with her advice. Rachel Hollis is 35 years old. Hollis implores readers to stop worrying about external pressures to always do more and, instead, to find fulfillment by getting in touch with their own desires and feelings. Wasn’t getting in touch with her desires what got Eve (and Adam and all of humanity) into trouble with God? (Genesis 3:6). Do you see the problem? As the book blurb describes, as we women grew up, the world lied to us. We believed it. So now we cannot live productively or joyfully unless we give ourselves grace, use our own strength and tenacity to pull ourselves up by the bootstraps and be who we were meant to be. All without a solid mention of Jesus in the book. What is Thomas Nelson’s Christian mission? Thomas Nelson is committed to one central mission: inspiring the world by meeting the needs of people with content that promotes biblical principles and honors Jesus Christ. I read the introduction, Table of Contents, chapter 1, 2, and 3, the end notes/acknowledgements, and the study guide. Mrs Hollis is definitely a skilled writer. For those of you who are moms, especially millennial moms, this book may well appeal to you. Hollis structures her book by titling each chapter with one of the “lies” women “have been told”, spends the chapter discussing that “lie’s” impact on her upbringing and life, and concludes with ‘helpful tips’ on what helped her overcome the “lie”. I’m placing the word “lie” in scare quotes for a reason that will be discussed in the Conclusion. Here are the chapter titles. I hesitated to include these chapter headings that represent ‘the lies’ we as women have been told, (or that we believe on our own impetus) because they speak to the common experience of many women. It’s not that to which I object. It’s the fact that she fails to identify the “lies” as a secular worldview with all that entails, and her solutions are self-sufficient and not Jesus-oriented. The section on her brother’s suicide brought tears to my eyes. Rachel is transparent, holding nothing back about her own foibles and mishaps. She is real. She’s engaging, and that is always the trouble with popular female speakers and authors. Sometimes, being empathetic and nurturing, we women focus on how winsomely the story is told and how it made us feel rather than comparing it to the Bible to see if it is so. I wish she had written that the takeaway for the book was that Jesus is our Lord and Master and that I am ultimately and solely responsible for my sin and my response to it. Or that I am responsible for obeying Jesus and it is obedience to Him that brings joy. But, she didn’t say either of those things nor anything close to it in the parts I read. I’ve personally never heard a Christian writer refer to the Apostles, on whom the foundation of the Church is laid (Ephesians 2:20) as “Jesus’ BFFs”. That aside, it is error to say that love, joy, peace, forbearance, kindness, goodness, faithfulness, gentleness and self-control are attributes we should all have regardless of what one believes in. We all do not have those attributes. People who are unsaved mimic those attributes. It is only a mimic because the genuine article comes from Jesus. If one is unsaved the goodness one displays does not please God because it is born of the flesh, not borne of the imputed righteousness God sees when He looks at us and our works. (John 15:5). The two are night and day. Sadly we women are told repeatedly that judge not and love thy neighbor IS the faith. This is simply more claptrap from Hollis. In sum, the book is about lies women have been told by society, media, family, or the devil and author Hollis dispels those lies by assuring women they are strong and courageous and beautiful and warrior and made for more, and all that. 1. Just because someone calls themselves Christian and is really, really famous right now, doesn’t mean they have an orthodox Christian message to share. As a matter of fact, the warning in Luke 6:26 indicates just the opposite. 2. While there are many good Christian Publishing Companies (Westminster Books, Banner of Truth, etc), Christian Book Publishers for the most part…aren’t. Just because a company calls itself “Acme Christian Publishing Company,” doesn’t mean they are selling you edifying books. Discernment is important. Usually, the more popular a book or author is, or the more the secular world knows about him or her, it means the opposite. See #1. 3. The “lies” Hollis claims to be busting is simply the secular world view. That’s normal, the whole world is in the sway of the evil one (1 John 5:19). The world lies to us. Always. That Hollis is giving you engaging self-help tips on how to deconstruct those lies and push on toward higher/better/more clear living, absent the Bible’s instruction, is just more lies. She is sending you from one end of a secular world view, to another. You will come full circle. Picture it this way. Being inside her world is like being in a balloon. She is sending you all around inside it, from one end to another. But it’s always the same view because you’re always inside that balloon. ONLY the Bible is the sword that pierces soul from spirit. (Hebrews 4:12). It punctures that false world view and exposes your eyes and mind to the truth, which is outside the balloon (flesh). Look at Hollis’ Twitter bio. What’s missing? And what’s there? Nothing about being a mother. Nothing about Jesus. The ‘Ms.” speaks volumes. When you wash your face and look in the mirror, do you see a sinning but forgiven, meek, humble woman with a Christ-like countenance of Jesus reflecting back? Or do you see a strong, empowered, warrior princess grrrl, living a life of self-sufficient ‘passion and hustle?’ If you see the latter, you’re being lied to. Girl, Wash Your Face: Not recommended. Throwback Thursday: Does God Speak in Unidentified Promptings? Thank you so much for this review- it was literally exactly what I was thinking as I read it and I was literally sick to my stomach and could not finish it. I was appauled at the glorification of self and the complete lack of the NEED for Jesus, Jesus being the answer and the absense of bibical truths. I stand alone against many of my Christian friends who have read this and love this book. Makes me sad but I just cannot support this book or what the author stands for, ever. You hits nails squarely on the head with an appropriate critical eye. This is part of an on-going trend to turn Jesus into just a self-help aid to make people more comfortable and happy with themselves, just as they are. This “Jesus” isn’t a Savior who takes away our sins, but a life coach who tells us we don’t need to be saved because we’re already fine. The “gospel” of humanism is that our downfall, rather than sinning against God, is that we don’t recognize our inner worth and potential. Thus, “salvation” is not in recognizing our sinfulness and repenting of it and trusting in Christ to save us. Rather, it is in expunging thoughts of shame that keep us from our innate potential. Sin isn’t the problem. Bad thoughts about ourselves are the problem that we must overcome. That’s already the teaching of our culture, and it’s a false gospel. Unfortunately, some have tried to baptize this false gospel with Christian terminology, and many have fallen for this deception, thinking this is real Christianity. But only the true gospel saves. Thank you. I appreciate you taking the time to review this so thoroughly. Saves me a ton of effort! I don’t see how a Christian could enjoy this book, but I see your point about how she’s a good writer and when writing about common experiences she may elicit her reader’s attention, and thus, allegiance. Unbelievable. How can you write about a book you haven’t even fully read? Why would you publically attack someone (you know, the warrior princess girl) on social media? Scripture teaches us to go to that person. This is so wrong on so many levels. Maybe you’re trying to find your own fame. Go for it, but not at the cost of another person. And trust me, this kind of writing will not bring the nonbeliever to Christ, but it will increase the self-righteous, judgemental “Christians.” This has to sadden Christ so much. I am wondering if you have any scriptural concerns with what I offered about Hollis’s book? I did note that Hollis believes Mormons and Catholics are in the faith. This is heresy. I also noted that Hollis’s main tenet of her faith is ‘love they neighbor’, not ‘repent and believe”. (Mark 1:15). Also heresy. I wrote that her book is all about self. This is the opposite of what scripture teaches. (Mt 16:24). No concern with any of that, Jill? No? Only an issue that I wrote about her heresies? I am obviously not as familiar with what saddens Jesus as much as you are, but I do know it saddens me that women consistently misunderstand and misapply the ‘go to her privately’ chestnut. Hollis’s book is public, her teaching is public, and thus my review is public. People do public book reviews all the time. I was responding publicly to Hollis’s public sin. By the way, did you come to me privately? No. You don’t even follow your own commands 😦 . Here are some resources that (hopefully) deepen your discernment and understanding of the scriptures to which you allude (but don’t quote). Again, it saddens me that so many women, including you Jill, lack discernment to the extent that you would make such a judgmental scripture-less reply to someone who has attempted to warn you of a false teacher. Here are those resources I mentioned. I have no comment on your review of the book as I haven’t read the book and I’m not yet familiar with your own personal beliefs or how you profess your own faith. I will tell you that as a member of The Church of Jesus Christ of Latter-day Saints, it is not heresy to say that we are members of the Body of Christ. We teach, preach, and believe in Jesus Christ as our savior and redeemer and that he is the only one who can fulfill those roles. I understand that many sentiments in the world might try to teach that members of our church are not Christians, but as a follower of Christ, I assure you I am. I would invite you to check out http://www.lds.org or http://www.mormon.org to find out what we truly believe before you call another faith heresy. It would be terrible if I called another religion heresy without having first examined the original documents from the source. You assumed wrongly that I have not. I have. How do you know for sure you are going to heaven? I grew up as a Southern Baptist and did not convert to our faith until I was an adult. I can assure you that ‘our’ Jesus is Jehovah Jireh of the Old Testament and Jesus Christ of the New Testament. Unfortunately there is still a lot of misinformation about our church readily available by others who may not believe as we do. I’m not sure what original documents from the source you think you have read but our original documents and scriptures of faith are The Holy Bible and The Book of Mormon, which is Another Testament of Jesus Christ and his ministry. Again, I would encourage you to go to the actual source, the Church itself, to read the tenants of our faith before calling anyone a heretic. Our First Article of Faith states, “We believe in God, the Eternal Father, and in His son, Jesus Christ, and in the Holy Ghost.” That is where we begin and our foundation. There is only one Christ and because I know him as my personal Lord and Savior I assure you I have a place in heaven with all of my family that have gone on before me. By definition The Gospel is The Truth. That truth is testified by The Holy Ghost, which was given as a gift to not only be a teacher of truth but also a comfort and a guide. Truth is found throughout the scriptures and particularly in Christ’s teachings in both The Bible and The Book of Mormon. I am not a serial commenter (I won’t comment again) and do not take offense when others disagree with my faith simply from misunderstanding or ignorance, but in the event that anyone not familiar with our faith is a reader of your essays I wanted to publish clarification and not further perpetuate confusion. The gospel of Jesus Christ is the most amazing gift we have been given and the rock-solid foundation of my life and that of my family. I wouldn’t have it any other way. Mandy, I have read your faith’s original documents. Again, I say, I have read them directly. Mandy, thank you for being faithful to your faith and in such a kind way. In fact, I wish many Christians would be as gentle as you and as persistent. Readers, Mormons have a deep fear of heaven because their faith is works based and there is no clear benchmark on when they have attained it. As for assurance of salvation, Mormons will often reply as Mandy has, that she knows the truth because she can testify that the Holy Ghost has testified to it. Second, you can ask them how they get their testimony. They will say by the Holy Spirit. They will say that the Holy Spirit does. Correct him gently by showing him that the Holy Spirit Bears witness of Jesus (John 15:26) and that Jesus sends the Holy Spirit (John 15:26). Once you’ve shown them that the Holy Spirit is sent from Jesus, ask them if a false Jesus will send the true Spirit of God. The answer, of course, is no. Mormons will speak Christian words like Trinity, Jesus, Gospel, etc. But they have a different Jesus, they believe the Trinity is three separate gods and their gospel is based on grace thru faith AND works, which is no Gospel at all. (Eph 2:8-9). And so on. I had a bad feeling about this book right from the beginning (maybe as you said because of the popularity of the author or maybe it was a spiritual discernment, 🤷🏻‍♀️) anyways, I delved into her IG account and also read some excerpts from the book and it grieved.my.soul. One because it was a self-focused book with a few mentions of Jesus and it was really geared towards christian women and two because christian women for the majority, have been eating this heretical teaching up. I’ve been warning about it as well on FB because I don’t have a blog lol! It’s evident the majority are not in The Word enough (if they’re longtime christians) or new believers, and how so easily we can be led astray if we don’t know the truth enough to weigh it against what we are putting into our minds, it brings to mind 2timothy 3:1-7, and convicts my own heart of being ready to give an answer when things like this come up. Thank you sister for calling out the false teachings and backing them with scripture. Praying for continued boldness to speak truth in love and righteousness!